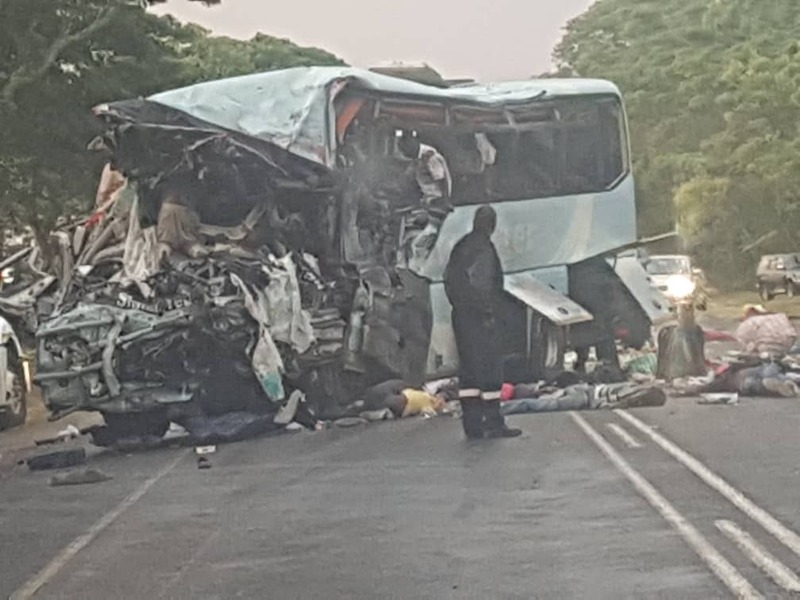 Police Spokesperson, Assistant Commissioner Paul Nyathi confirmed at least 47 people died in an accident involving Smart Express and Bolt Cutter buses near Rusape tollgate on Wednesday evening. Reports indicate that the buses had a head on collision Nyathi said they have so far identified 47 bodies at the accident scene. Of the 47, 45 are adults while two are children. In an update on Wednesday evening, The Herald said Makoni District Administrator and Chairman of the District Civil Protection Unit, Mr Darlington Museka said Rusape General Hospital Mortuary is now overwhelmed. They are engaging Nyaradzo Funeral for assistance. This is so sad indeed. There should be a solution to these road accidents. The solution lies with every road user out there. A high percentage of Drivers in this country show no discipline, integrity or respect to rules of the road. They are not clever, they are dangerous and should not be tolerated. The police have lost control but every one of us has an obligation to do the right thing. Passengers. .. if your driver is putting your life in danger, act as one… stop the bus/taxi, demand your money back and get off. Let’s get safety and good driving back on the roads again. Sandile you have said it all. From the picture it’s a good road and the road markings clearly say no overtaking in both directions how is a head on accident possible. This is reckless behaviour by both drivers. It is the duty of passengers to stop reckless drivers. Maximum speed is likely 60km/h on this stretch of road. Anywhere who has legalised the speed of over 100km/h for buses on Zimbabwean roads as they now are always driven faster than cars. May the Lord comfort the families. Operator licences for these 2 companies and any other company that has drivers that have no regard for people’s lives must be revoked. there are Satanic Forces at play here ! Devil worshipers do this on a regular basis – they combine forces of Evil and wait patiently for such accidents to happen . its the blood of innocent victims that they want. tingataure zvedu zvakawanda but these Satanists are to blame . besides its a spiritual world in as much as it is physical world vanhu wee ! we need strong believers to counter act Evil doers .